Visual storytelling may be the new normal for digital journalism, but what about audio storytelling? This is the road less taken by new podcast ‘Serial’ and the audience response has been impressive. Their most popular episode to date had around 840K listeners, almost triple the original goal. The first season of ‘Serial’ delves into the case of high-school senior Hae Min Lee who was found dead her ex-boyfriend Adnan Syed was convicted for her murder. Currently serving a life sentence, Adnan still maintains that he is not guilty. Reporting for the podcast began during the summer of 2013, when a family friend of Adnan contacted Sarah Koenig (host and executive producer of ‘Serial’) to ask for her help with the case. Sarah [Koenig] initially pitched this story for TAL but it was around the same time that she and Julie came up with this idea for a new show to do a serialised long-form story and the two just went together so well. I think that the decision to do it as the first one was a little bit serendipitous. And it’s a fantastic story for a serialised format. It’s so gripping. We don’t. We’re still producing the whole thing. We are ‘guesstimating’ about 12 to 14. But right now we’re literally putting the finishing touches on episode five so we’re on a one-to-one week schedule. There have been a lot of questions like, ‘Just give us all the episodes!’ We’re not trying to be stingy, it’s just we’re still producing them! We have an idea of how it ends, but because we’re still reporting, we’re very open to the thought that that idea might change drastically. What is the goal coming out of this podcast? Is it just to tell a good, engaging story or is it more to get Adnan’s trial revisited? The goal is not to have him retried or exonerated. We don’t have an opinion right now as to whether or not he should be. The goal is more to tell this story in an engaging format and in an accurate fashion and to keep people interested in it. This is a long time to ask people to stick with one story. So if we can manage to do that all the way through, to make people feel as satisfied as we are that we all learned everything we could about this story, then I think we’ll all feel pretty good about it. I wanted to know if you discussed any tension that might come up with producing a piece that’s really entertaining yet very serious. Because as I’m listening, I react as if I’m watching a murder mystery, but this one has real consequences. How do you deal with that dynamic? I think it’s a fact of humanity that the two things aren’t always mutually exclusive. And we’re very cognizant of the seriousness of the story, and the basis of the story which is an absolutely horrific unimaginable crime. And we’re cognizant of that all the time. And though we’re trying to tell the story in a compelling way, we’re not sensationalizing this crime, we’re not playing up the violence and the gore. We’re trying to tell it on a very human level. There is an interest in the humanity of the story and the world of these people who were involved in story itself. Obviously, it’s not separate from the horror of the crime but it is another thing that we react to as an audience. There are plenty of true crime shows, books, journalism that people find fascinating and engaging and entertaining to a certain degree and that’s just the genre in a way. That’s certainly not something new. Do you had any other ideas for a second season, or what other subjects could take on this serialised form? There aren’t many out there now. Most podcasts are episodic. ‘Welcome to Night Vale’ comes to mind as a fictional serial. What are your thoughts? This story itself seems obvious for this format because of the mystery of it. Every episode there’s a question that we are asking and that’s something that happened to us in the reporting of this and there were just a million questions that are coming up that we gotta find the answers to. This particular season to me is really well-suited for this serialised format. We don’t have season two picked just yet. We have some contenders and we’re also still looking for stories. But I think that the thing about season one that will carry over, without a doubt, is that the story will have a great plot and forward momentum and fascinating, compelling characters. Season two won’t necessarily be another murder story, it might not even be a true crime story. In fact, it probably won’t be. But the core elements of the way we’ve told this particular story will carry on to season two. You won’t go into fiction, would you? No, we’re a documentary. Sarah is the host. She’s a reporter. That’s what she does, so it’s wouldn’t be fiction. I think it’s absolutely possible. As an example, TAL often does partnerships with newspapers, magazines or ProPublica. It’s absolutely something that could happen. TAL did a story recently in partnership with ProPublica about the New York Fed. It was about a women who worked at the New York Fed. And she basically had a bunch of secret recording that she did in meetings at her job and the story was about what came out of those recordings, what came out of her experience at the Fed. But to your point, I think it’s absolutely a possibility that you could be a newspaper and do an interesting podcast, using your reporting talent. In terms of serialised podcasting, I definitely think that’s an idea that could take off. Do you know ‘Start Up’, Alex Blumberg’s new podcast? I highly recommend it. He’s calling it a mini-series, but it’s the same idea. He’s telling the story of trying to create a start up. It’s similar in that he’s making his mini-series as he’s living it in a way that’s very similar to what we’re doing. The idea of the podcast is cohesive with the general democratisation of the Internet and content is that people can listen to it whenever they want. They don’t have to tune into their radio at a certain time. You can listen to your podcast whenever you want. Binge-listening is interesting because we’re still reporting it and producing it as we go, I think if we did it the other way, if we produced 12 episodes and then just gave them to the world, it would have a slightly different feel to it. It could be like a TV show where people could say, ‘I’m just going to wait until they all come out, so I can listen to them all together’. Which is fair too. But I do think the fact that we’re reporting it, producing it, writing it. Sarah’s just a couple days ahead of her audience. It gives the show a different feel, a little more present. And I think that even if you decide to wait until December to binge listen to all the episodes at once, you’ll still pick up on that feel. ‘Serial’ feels like something very new. But in fact, it’s a bit of a call back to the radio dramas of the past. Is that an inspiration to you? 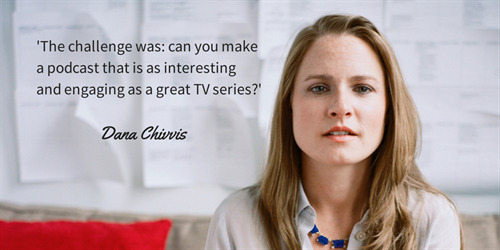 For me, and I think Sarah and Julie would agree with this part, the challenge was, can you make a podcast that’s as interesting and engaging as a great TV series. So that’s what I think back to. I think it’s funny that people have said to me, ‘I’m so excited to listen to this week’s episode, but I’m waiting until I get home so I can listen to it with my boyfriend’. I was surprised that people aren’t just sticking their earbuds in and listening by themselves. People are actually sitting down together and listening to the shows, which does harken back to the old days of radio dramas. It’s two different questions. The first one is about long-form storytelling and from a financial perspective when you think about how long we’ve been reporting the story, Sarah and I have been working on it full-time since January. And Julie has been doing her job at TAL this whole time too. My point being, that kind of investment in a single story is something you don’t see all that often these days. It makes such a tremendous difference. For Sarah to have the leeway to spend all her time reporting, thinking about the story and researching. It feels like a real luxury right now. The other side of the question, is about podcasting specifically as a format. We are a very small team. We’re just Sarah and me full-time, Julie who also does her job at TAL, and Emily who also does her job at TAL. And Ira as our editorial advisor. The idea of thinking about podcasting in a new way is really taking off and there are some businesses who are starting to reconsider how you can do podcasting. Alex’s company is one of those. So the way the editorial process works is that Sarah will write a first draft of the script and when she’s done with that, she will read it to us and play the tape that goes along with it. We’ll do an edit and we’ll generally go through three edits before we arrive at a final draft and after that we’ll do some fine tuning. That’s over the course of a week. Once we get to a final draft, Sarah and I will record her voice tracks and then Julia and I will build the podcast itself and then send it off to Mark who does our sound design and scores the show. Then in the background of all that, we’re still reporting things, researching, running the website and handling social media too. Is there anything else you’d like to add about the podcast or your experience with it? The response has been tremendous. We’re so happy people are really engaged with the story and are really excited about it.